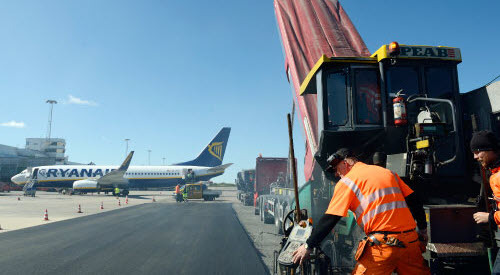 Surfacing work at an airport differs in many ways from the situation on a road. The weight and speed of aircraft place particularly strict demands on bearing capacity, friction, evenness and surface quality. The asphalt must also be resistant to aircraft fuel, de-icing agents and other chemicals. And because of the wide open spaces the asphalt becomes extremely hot in the summer, approaching 55 degrees, which can in turn give rise to deformations. Gothenburg Landvetter Airport is the second biggest in Sweden with around 5.2 million passengers every year. A relatively high increase in the number of passengers is expected in the next few years. Landvetter is part of a network of ten Swedish airports that are owned and operated by the State-owned company Swedavia. In 2014 a framework agreement covering several years was signed with Peab Asfalt for surfacing works at all of Swedavia’s airports. According to the current maintenance plan for Landvetter, the area in front of the gates where the aircraft park, known as the Apron, needed upgrading. Apart from one topping process at the end of the 1990s, no surfacing measures have been carried out on the area in question. It was therefore high time for comprehensive action, the first stage of which was completed in June 2015 and involved around 100,000 square metres. Because the technical useful life was nearing its end, it was decided to mill down deep into the base course. The surface was then built up again with three new layers of asphalt with a total thickness of 150 mm. All milling was mechanically controlled in order to achieve the best result and to guarantee that courses of uniform thickness could be laid. The base course consists of 60 mm PG 76-28, where the designation PG (Performance Grade) refers to a bitumen that is graded on the basis of its performance at different temperatures and is therefore often used at airports. 55 mm ABb22 Nynas Endura Z3 was chosen for the binder course, while the wearing course consists of 35 mm ABT11 Nynas Endura Z3. Included as an additional strengthening measure was carbon fibre reinforcement between the base and binder course of around one fifth of the area. On particularly sensitive parking areas a composite surface was also used, combining cement and asphalt in order to withstand extremely high concentrated loads. In total Peab laid 13,000 tonnes of asphalt during the period in question, 10,000 tonnes of which used Nynas Endura Z3 as a binder. The base bitumen included in Nynas Endura Z3 is harder than normal in order to enhance the stabilisation properties. Despite this, the asphalt mass can still be laid at normal temperatures, as the binder has been modified in several stages. By using a highly modified binder, the client wanted to increase the useful life of the surface and thereby in due course achieve significant financial benefits. In order to guarantee the best possible outcome, preparations included three test surfaces, which were analysed carefully with regard to everything from cavities to structure. Although traffic will increase significantly at Landvetter in the next few years, it is expected that the surface will last about 20 years, and this has been included in the maintenance plan for continuous monitoring. What must be borne in mind is that it must withstand major rigours. These include aircraft with full fuel tanks making their way out to the runway, and also from glycol and other chemicals, as well as the large differences in temperature to which the asphalt is exposed. The use of a highly modified, rigid binder such as Nynas Endura Z3 is therefore a decisive advantage.